12 volt LED Reading Light: FriLight 8400 Classic metal fixture with round base, rocker switch, Multiple LED choices - see LED Details. 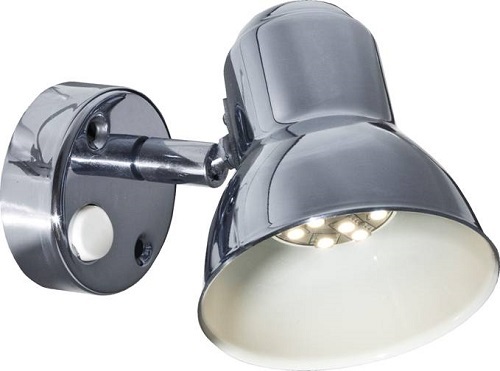 SalVinCo.com>12 volt LED Lights>12 Volt LED Reading Lights > 12 volt LED Reading Light (10-30vdc): FriLight 8400 Classic metal fixture with round base, rocker switch, Multiple LED choices - see LED Detail. 12 volt LED Reading Light (10-30vdc): FriLight 8400 Classic metal fixture with round base, rocker switch, Multiple LED choices - see LED Detail. 12-24 volt dc (10-30v); Multiple LED choices (see Bulb detail). Our true "Classic" design compact metal light LED reading fixture with rocker switch. Surface mount light. Swivels right to left, up/down. Low power consumption - LED bulbs use up to 5x less power than their equivalent halogen and Xenon predecessors. Most of our fixtures are available with Warm White, Cool White, Red or Blue LED bulbs. All LED bulbs are 12v-24 volt (10-30v dc). Constant current and EMI free.